Rent Control may be coming to San Diego County sooner than you think. National City renters recently gathered 3,600 signatures to place the National City Rent Control and Community Stability Ordinance on the November 2018 ballot. The implications that this may have on property owners, renters, and our local economy could be immense. We encourage all property owners to educate themselves on this matter and understand it’s potential consequences. If you would like a full highlighted copy of the ordinance, please leave us a comment below and we’ll be happy to send you a free copy. 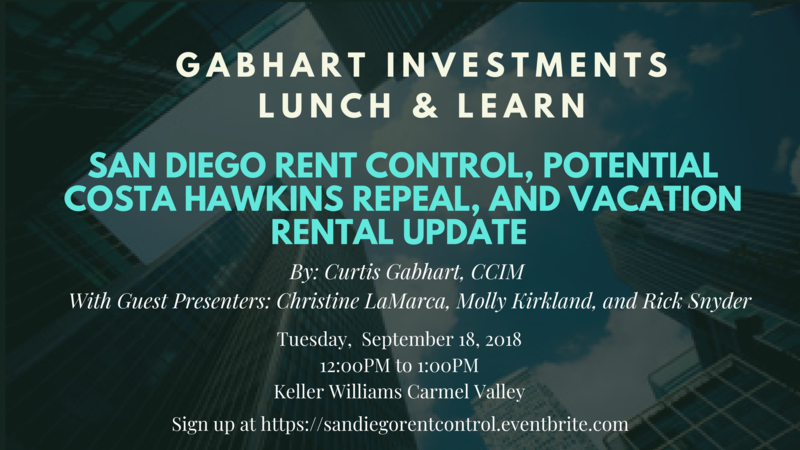 In addition, I will be hosting an informative lunch and learn on September 18th that will be covering rent control and the recent vacation rental restrictions. Click here for more information and to RSVP. All rental properties would be subject to this measure except for single-family homes with granny flats, rooming houses, student housing, and subsidized affordable projects. All rental rates will be placed back to the date this ordinance was published (March 2018). The rent charged at that time will serve as the base rent for the unit. The base rent will be allowed to increase by the inflation rate (CPI) of up to 5%, but no more regardless of whether inflation went beyond 5%. This ordinance does not allow for the standard of vacancy decontrol, where an owner would typically raise rents to market upon a tenant moving out. This means the owner must keep the unit at the current controlled rental rate. Establishes a 5-member National City Rental Board (NCRB). This Board would have the authority to set and adjust annual rent rate for rental properties. The Board must be composed of at least 3 tenants currently renting in National City. The Board would finance its “reasonable and necessary expenses” by charging landlords annual rental housing fees. This would start at $120 per unit and is subject to increase by the Boards discretion. Most rent control boards in California charge between $240-$360 per-year per-unit. The Board would create a “base rental rate” and units would be assigned a maximum allowable rental rate that the landlord could charge a tenant. The maximum rate could be adjusted higher or lower with the Board’s discretion. Landlords wanting to increase their maximum allowable rate would have to petition the board for approval. Contains a Just Cause Provision, which significantly decreases the landlords right to require a tenant to vacate unless under specific circumstances. The landlord must file with the Board justification as to the why the tenant is being evicted. If the landlord plans to remove the unit from the market, they must notify the Board and provide a minimum of 120 days notice to tenants or 1 year if the tenant is a senior (62+) or disabled. Relocation payments will also apply. The landlord would have to provide $7,000 to the tenant or $10,000 to a senior/disabled tenant for relocation assistance. This is the 1st year established fees and would be subject to increase per Board review on a yearly basis. Any significant repairs requiring a temporary-vacation of the unit for more than 30 days are subject to relocation assistance fees. The evicted tenant possesses a “right of first refusal” and is allowed to take back the property if the owner places it back on the market. The tenant will also be entitled to pay the same rental rate they initially paid. For example, an owner decides to move back into his unit for 5 years, and then suddenly decides to place it back for rent. The owner must then offer it to the prior tenant at the last rental rate they paid. Any attempt made to recover the unit in violation of the ordinance shall render the landlord liable to the tenant for actual damages, including damages for emotional distress, in a civil action for wrongful eviction. Landlords and tenants are prohibited from making agreements that contradict any provision in the ordinance. These private agreements would be deemed void. Ratio Utility Billing (RUB) is prohibited. Rental owners may not charge for utilities unless they are individually metered. Landlords must petition the rent board for any request to increase the maximum allowed rent. Hearing examiners may review an owner’s books and records and conduct a building inspection and/or request that the City conduct a building inspection. Tenants may request that a hearing examiner conduct an inspection prior to a hearing. The City Council, City Manager, and City Attorney will not have any power to oversee, supervise, or approve the Board’s yearly budget. The Board will be allowed yearly assess and determine if there is a sufficient number of hearing examiners, housing counselors, and legal staff to effectively carry out the ordinance. This would increase the budget and cannot be overseen by City Council. The landlord’s failure to comply with any of the requirements in the ordinance can result in the tenants right to withhold rent. After the issue has been resolved by the owner, the Board will get to determine how much, if any of the withheld rent, will be owed to the owner. Any rental owner who demands, accepts, receives or retains any payment in excess of the amount allowed under the Ordinance shall be liable in a civil action to the tenant, including general and special damages and emotional distress. Additionally, the tenant will be entitled to costs and expenses. An order authorizing rent withholding shall survive the sale of the property and shall be binding upon the successors of the rental owner. These are just the main highlights of the proposed ordinance. I strongly encourage you to read through the entire ordinance and familiarize yourself with it. If you would like a copy of the full ordinance, I would be happy to send you one. Just let me know if the comments below. 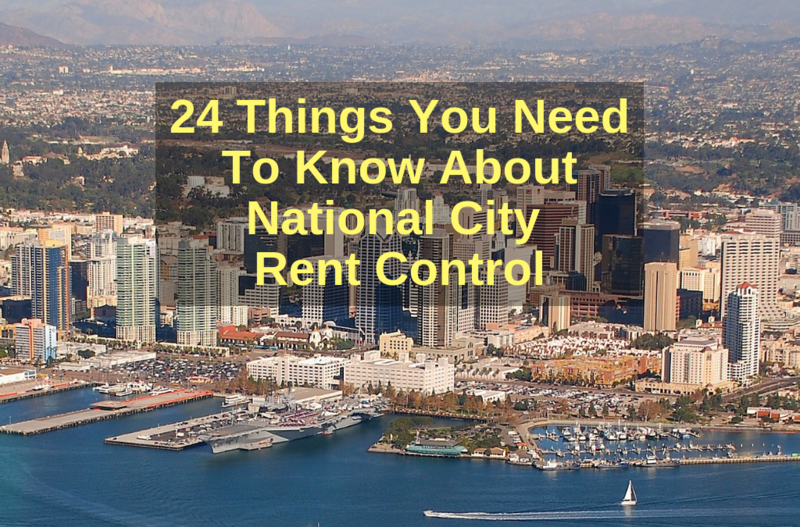 Stay posted for more updates on Rent Control in National City. If you haven’t checked out my earlier blog post on the proposed San Diego Rent Control efforts, click here to read more. I hope to see you at my upcoming lunch & learn on rent control and vacation rentals. This will be a great chance to get your questions answered and to hear more about this issue. If you a property owner and have concern over how this could affect your investments, my team and I would be happy to help. We have a wealth of experience in the multi-family industry and provide our clients with unmatched expertise. Give us a call today at (858) 356-5973 or click here to send us an email. The information presented in this article represents the opinions of the author and does not necessarily reflect the opinions of Gabhart Investments, Inc. The material contained in articles that appear on gabhartinvestments.com is not intended to provide legal, tax or other professional advice or to substitute for the proper professional advice and/or commercial real estate due diligence. We urge you to consult a licensed real estate broker, attorney, tax professional or other appropriate professionals before taking any action in regard to matters discussed in any article or posting. The posting of an article and of any link back to the author and/or the author’s company does not constitute an endorsement or recommendation of the author’s products or services. Great article, Curtis. I agree, this ordinance would kill our rental market and place unfair power in the hands of renters and the rent board. Vote no! !